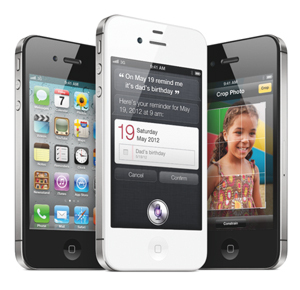 How much faster is the iPhone 4S? October 17th, added iPad 1 running iOS 5.0 and added the "Egypt 720p" graph. GLBenchmark 2.1 includes an interesting Egypt 'walkthrough' in High Quality revealing how well the iPhone or iPad handles on-the-fly rendering of textures, dynamic shadows, etc. Higher number is faster. The above test is a bit unfair since the resolution of the iPhone and iPad is different. Plus we found out that the "Egypt High" test is limited to 60 FPS. So I've added the graph below using the "Egypt Offscreen" test where all high-level scenes are also rendered off-screen, with the same 1280x720 pixel resolution on all devices. This method provides apples-to-apples performance comparison for the embedded GPUs. We are only able to graph results with iPhones and iPads running iOS 5.0. If you run the above test on your iPad or iPhone, divide the "total frames" result by 113 seconds to get Frames Per Second (FPS). OpenGL Extensions Viewer (GLview) measures OpenGL graphics speed. There are four different animations that run to give you frame rates. We ran the "Cubes" animation with Transparency, Multisampling, MipMap, Anisotropic filtering enabled. Higher number is faster. The iPhone 4S with the dual-core CPU and dual-core GPU is definitely faster than the iPhone 4. We plan to delve into the performance more deeply, but Geekbench's overall score was 63% to 68% faster, depending on what version of iOS we were running on the iPhone 4. The iPhone 4S ran GLBenchmark's "Egypt Offscreen 720p" test 5.9 times faster than an iPhone 4 (both running iOS 5). That doesn't confirm the "up to seven times faster" GPU claim, but it is close enough that we're impressed. We like the new camera lock screen shortcut and the ability to use the volume button to snap the photo. Very nicely done. At the news conference announcing the iPhone 4S, it was said that it takes one second for the camera to be ready to take a photo and a half second to be ready to take the next photo. After upgrading our iPhone 4 to iOS 5, the same is true of it. For an in-depth review of the new camera, I recommend an article on HDSLRreview.com. It would have been nice to have LTE 4G support, but overall I'm very pleased with the new iPhone 4S. Anandtech GLBenchmark graph shows iPhone 4S 'smoking" the Droid Razr and Galaxy Nexus smart phones.